Something in the Water had me totally hooked from the first page. The novel begins with a bang and then just continues to get better and better. I think what I loved the most was that I couldn't wrap my head around what would happen next. It also kept making me think what I would do in that situation, and to be honest I still don't know! This novel is filled with intrigue and excitement from the first page until the very last and I can't recommend it enough. The setting was incredible and the world building was perfect. I could picture the scene as if it were happening right in front of me or on my TV screen. And speaking of TV screen... I need someone to make a movie of this novel ASAP! 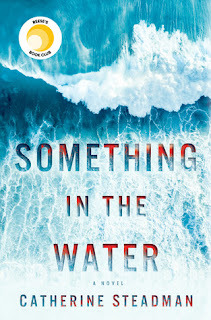 All in all, Something in the Water is the perfect summer thriller and I would highly recommend it! It is full of twists and excitement that will leave you guessing until the last page. Thank you to Penguin Random House/Ballentine and Netgalley for sending this novel in exchange for an honest review.